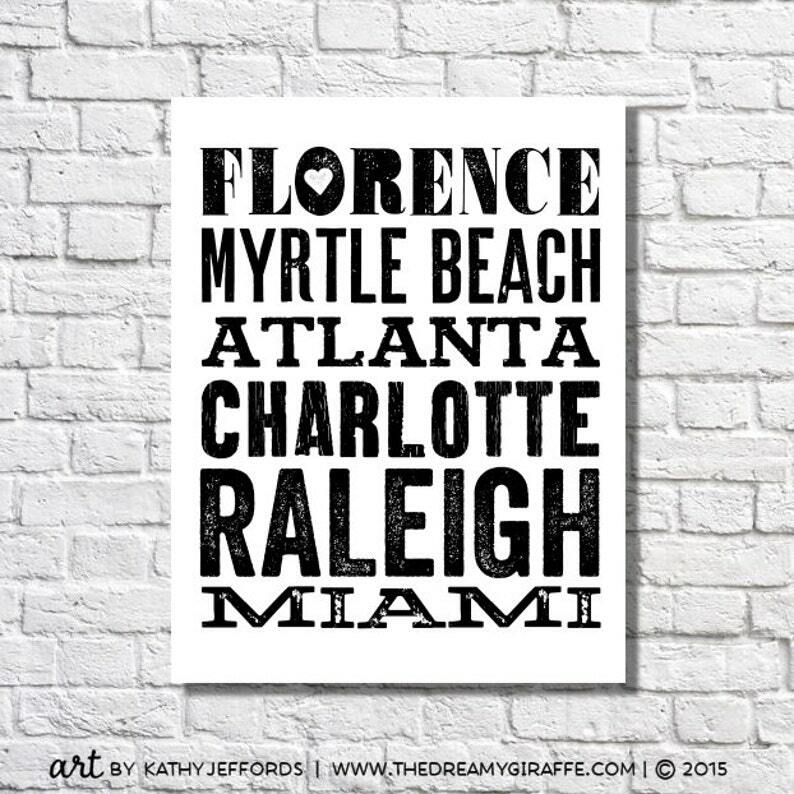 Please list the names of the places you'd like on your print. If you order an 8" x 10" or 8.5" x 11", the print will fit 6-7 places. 11" x 14" and 16" x 20" can accommodate up to 15. Also include which city you'd like the heart to be on, if any. Thanks! My special date print (which can be seen here: https://www.etsy.com/listing/154380081/) has been so well received, I decided to create a special places print in a similar style. These could be places you've lived, places you love...or places you dream of going...it's totally up to you! It's pictured here in black and white, but you can choose any color from the color chart from the text. Is one of the places on your list super special? You can add the little heart detail, as seen in the example on Florence. Though I will use the similar font styles and types, please know that the sizing and spacing of the letter placement will vary based on the length of each location used. ● MATERIALS: Regardless of what size you order, my prints are printed with fade resistant bright and vibrant inks on an archival quality paper with a luster finish that enhances the colors and ensures they'll be just as beautiful years from now as they are on the day they're printed. ● PLEASE NOTE: Prints will be shipped to you directly from my professional printing partner and will not be signed. 8" x 10", 8.5" x 11", and 11" x 14" prints are shipped flat in cardboard boxes and 16" x 20" prints are shipped in sturdy cardboard tubes. Prints within are sealed in poly bags to ensure they will stay dry & protected during their travels. We use USPS, FedEx, and UPS to ship larger prints. No matter which carrier used, you will receive a tracking number as soon as your package is on its way. Within 48 - 72 hours, I will send you a proof of your customizations for you to take a look at and make sure the design is just as you want it before I actually print and ship. Please make sure the e-mail address associated with your Etsy account is up-to-date, as I cannot ship custom designs without approval. © 2015 Kathy R. Jeffords. Copyright not transferable with sale. Perfect! Lovely detail and arrived in timely fashion.